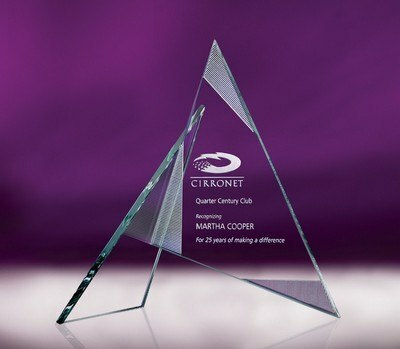 Celebrate a job well done with our Custom Zephyr Medium Jade Crystal Award, customizable with a single logo imprint. Voila! you have found a distinct, pioneering award, that is unique in appearance and fits well within your budget. The Zephyr, with its combination of jade triangles and engraved structures, is etched to perfection and offers a resounding tone of success and corporate excellence. It is the apt choice for those who go the extra mile without breaking a sweat. The award can be presented at award ceremonies, prestigious functions, and other promotional events.